AS Roma moved clear at the top of Serie A after beating Sampdoria 2-0 on Wednesday as struggling AC Milan came back from 3-1 down to draw 3-3 in stoppage time at Bologna. Mehdi Benatia's wonderful 65th-minute solo goal and a Gervinho strike gave Roma a hard-fought three points at Sampdoria and means that they have started the season with five successive wins for the first time in their history. Morocco defender Benatia scored the goal of the night when he dribbled past three defenders before somehow crashing home his first Roma goal as he fell to the ground. "There's always a first time for everything. Today we've shown that we're a good team, because we fought," Benatia told reporters. "I had the good fortune to score that goal and I'm happy because we've got the three points and we're still up there." Roma, whose manager Rudi Garcia was sent to the stands just after the hour, moved up to 15 points, two clear at the top after Napoli drew 1-1 with lowly Sassuolo. Massimiliano Allegri's Milan looked certain to lose their second match in a week following two goals from Diego Laxalt and another from Lazaros Christodoupoulos after Andrea Poli gave Milan a 12th-minute lead. But two goals in three minutes from Robinho and Ignazio Abate, who struck in stoppage time, enabled the away side to miraculously save a point in a thrilling finale. "I'm annoyed because even after coming back to 3-3 we gave the ball away cheaply and risked losing 4-3. These are things that shouldn't happen," Allegri said. "We played really well, created lots of chances and made mistakes defensively. "I think that we put in a technically impressive performance against Napoli and it was the same tonight. We can't capitalise even on 30 percent of the chances we create. "We need to improve on that just as we do on the defensive side of things." Blerim Dzemaili gave Rafael Benitez's Napoli the lead with a fierce drive after 15 minutes, running on to a poor clearance to thump home the opener. But Sassuolo, hammered 7-0 by Inter Milan at the weekend, fought back and grabbed a deserved draw through Simone Zaza, who beat Pepe Reina far too easily with a high shot from an acute angle in the 20th minute to give them their first point of the season. They could have easily come away with all three points had Reina not made a couple of smart saves in the second half. Champions Juventus came from a goal down to win 2-1 at Chievo Verona in a match marred by controversy over a wrongly disallowed Chievo goal with the scores level. Fabio Quagliarella had equalised for Antonio Conte's side in the 47th minute after Cyril Thereau had given the home side the lead when Alberto Paloschi tapped in what he thought was the home side's second. But despite being at least a metre onside for Simone Bentivoglio's original shot, the goal was ruled out for offside. Alessandro Bernadini then knocked in an unfortunate own goal from Paul Pogba's cross to compound Chievo's misery. "What I regret isn't so much disallowed goal as that we could have done better with what we created," said Chievo boss Giuseppe Sannino. "There are always going to be errors." The most entertaining game of the night was the game at the Stadio Ennio Tardini where Parma beat Atalanta 4-3. Six goals were scored in the first half and Parma's Amauri was sent off just after the interval. 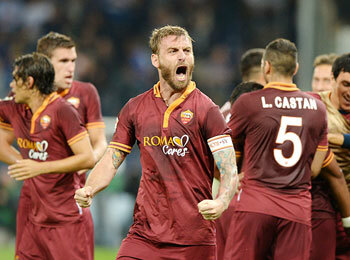 In other matches, Lazio beat Catania 3-1, Torino drew 2-2 with Verona and Cagliari drew 1-1 at Livorno. Inter and Fiorentina will test out their title credentials when they meet at the San Siro on Thursday. The 'Real' blunders: Is Ozil the Bernebeu club's latest faux pas?